Our Division of Nursing exchanged knowledge and experiences with students and recent graduates from the School of Nursing at Austin Peay State University, United States. Students and staff from City’s Division of Nursing extended a warm welcome to nursing students and recent graduates from Austin Peay State University, Tennessee in the United States. Led by their tutor, Professor Amy Hamlin, the visitors were given a tour of the The Royal London Hospital and Homerton University Hospital, City’s clinical partners, and where our nursing students are able to undertake their clinical placements. The visitors were also introduced to the University’s Clinical Skills Centre, which includes two six bedded wards with realistic equipment including piped oxygen, call bells, medicines, emergency and moving and handling equipment, which our nursing students train with during their studies. The Clinical Skills Centre is also one of the first in the UK to open a Technology Enabled Care Studio, 'City TECS'. The unique facility allows our students and practitioners across a range of disciplines to learn how to use the latest telehealth technologies through simulated learning. 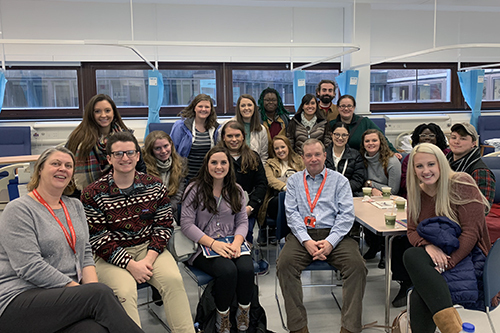 Nursing students and recent graduates from Austin Peay State University enjoy a presentation on ‘Learning to Care’ delivered by Mark Jones, Senior Lecturer and Programme Director for Adult Nursing at City. The visit also included trips to some of the health science landmarks that south east England has to offer, including the Florence Nightingale Museum in London, the London Royal College of Nursing, and the Underground Hospital at Dover Castle in Kent. 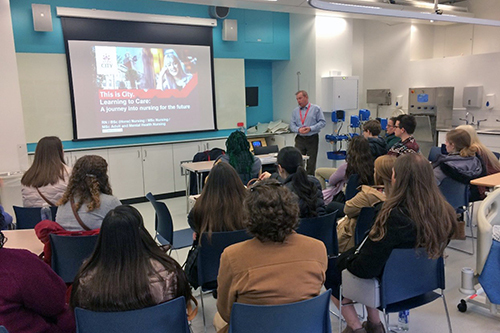 The students were encouraged to explore the similarities and differences between nursing studies and healthcare practice in the US compared to England during their visit. An aim being to improve the ability of students to contextualise worldwide health issues through the visit. Professor Hamlin said, “We have a tendency to be in our own world and not know there are similar universal issues going on in other countries. We can all learn from each other”. She also explained that the students from Austin live in a much more rural area compared to City students, hence experience less diversity and are therefore from “low diversity backgrounds”. She also said being able to eat global foods and interact with a diverse population was a rich cultural experience for the students. One of the biggest things we’ve learned is that nobody is certain of the impact of Brexit and also how it will also impact the US. Austin Peay State nursing student, Caz Authement, noticed that nursing studies at City were more specialised, whereas nursing studies at their university took a more generalist approach. Speaking of City, they said, “Every semester you study a different topic and eventually you graduate as a generalist nurse”. They added that prior to the visit, “we had to do a lot of reading around the healthcare system in the UK, but it makes so much more sense actually seeing it in practice”. Ally Bland, a recent nursing graduate from Austin Peay State said that before the trip, “I was naïve as to what free healthcare actually meant”. She also added that, “we’re seeing clients from a larger variety of backgrounds in the US now and we need to learn about cultural and religious diversity”.